1. Interesting take on ethics and its implementation into society. So this test can figure out whether you are a psychopath or not, and if they find hormonal proof of it, they can kill you in an instant. Put ten possible psychopaths in Compass Room and that’s what you will find in this book. This Compass Room along with the chip planted in their brain that figures out their hormonal levels, creates a lot of ethical questions. It makes you question the morality of the death penalty —or penalty by Compass Room (as you will see, it is actually quite gruesome), and it also questions the very essence of justice in our legal system and in general. As much as this book makes you ask questions on that front, it does not execute it well. I pulled these issues out because I am used to analyzing literature, but in all honesty, how she presents these issues is very flat. The entire novel, characters included, is flat. It’s quite disappointing when Harian has excellent concepts, but she is completely unable to render them into words that would actually make the reader feel more attached to the novel. 2. Writing style and other such terribly executed things. First off, you all know I have an issue with first person POV present tense. It’s just not something I care for. I can put up with it, and even like it if a book does it well, but this book made me cry out in pain as if I were grating my own hand over a cheese grater. No thank you. If you’re going to use first person, you need to have a reason for it. You need to use it so that your readers actually feel the emotions going on in your protagonist. If that’s not the reason you want first person, don’t use it! As for present tense, fine… okay… whatever, but be more creative and less plot driven. The entire book was one simple sentence after another, and everything was so direct it hurt. Her characters were so flat, it put a child stick figure drawing to shame. I mean seriously, I did not give one rat’s behind whether Evalyn got out of there alive or not, nor did I even care if she got with Casey. There was no development; yes, some emotions were shown, but did they invoke anything in the reader? No. No dimension, no pull, no nothing. This book was flat in every way but the spine. 3. It was like Hunger Games meets Cabin in the Woods meets Criminal Minds. Take the Hunger Games arena with people killing each other and add a little creepiness and psychotic ramblings and… Voilà! 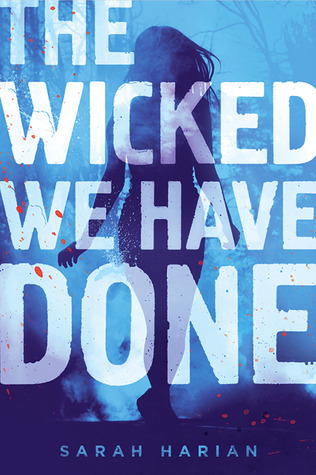 You’ve got The Wicked We Have Done …except, let’s be honest, it’s a more crappy version. I wanted this book to be so good, but really it just wasn’t up to par with anything. Better luck next time. All I have to say is I am so glad that I chose this book to read when I did —only because it made for an excellent rebound book. I really wanted it to be like an adult Hunger Games with a little Criminal Minds thrown in the mix, but it lacked in every way possible —even the love scenes were written horribly. Here’s hoping that the rest of this series isn’t quite so terrible, though I won’t read the next one in order to find out. Sorry this one was such a disaster for you! I don't think I've ever seen a New Adult title that wasn't contemporary romance, for that reason I am intrigued, but not enough to read it. I hate when a book has a good plot line but the author isn't able to execute it well. I know, right?! That's what pulled me in at first too! It seemed like an excellent concept, but I was so sad how terrible it was. Ouch. I feel your pain, having just finished a bad book myself. It's so disappointing when a good premise is done badly; it seems like a missed opportunity for something great. I'm not a fan of the first-person, present-tense POV, either. It's not the first-person POV that bothers me, per se; it's the writing in the present tense. If you've got a story that requires that tense for a good reason, fine. But it seems like it's just the tense du jour, something that's become necessary if you want to publish books for teens. I agree with everything you said. The first person POV does seem to be on the incline in YA lit, which can get a little annoying. Sometimes, it's warranted, but other times I feel like it would be so much better if it were in third. And same goes for present tense versus past tense.